Bearing issues highlighted at Spa meant I was on the hunt for an upgrade. I think the extra grip from the Aero and wider tyres contributing to the bearings and flanges suffering. I first had a flange failure in 2015 and now again showing wear at Spa. Initially I looked into boring out the mk1 uprights to take a larger mk2/mk3 golf bearing and flanges but wall thickness of the housing concerns were raised by many. I looked into the possibility of running late mk2/mk3 4 stud uprights instead. 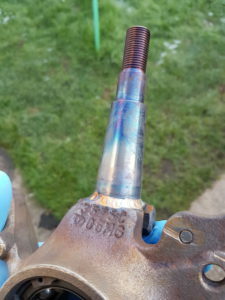 This with coincide with fitting a new set of weld in ball joint extenders at the same time.